Christopher Priest has a long history with Spider-Man, serving as a writer and editor on Marvel’s Spidey titles in the ’80s. As a writer, he would drop in for a few issues and then depart, and that pattern holds true with Priest’s new Spider-Force, a three-issue miniseries tying into the Spider-Geddon event. The plot of Spider-Verse was nonsensical, and the same holds true for its follow-up, which brings back the original crossover’s interdimensional vampires rather than creating a threat that is actually interesting. What makes these events fun is all of the alternate universe Spider-People, and the tie-in books are where these characters take the spotlight. 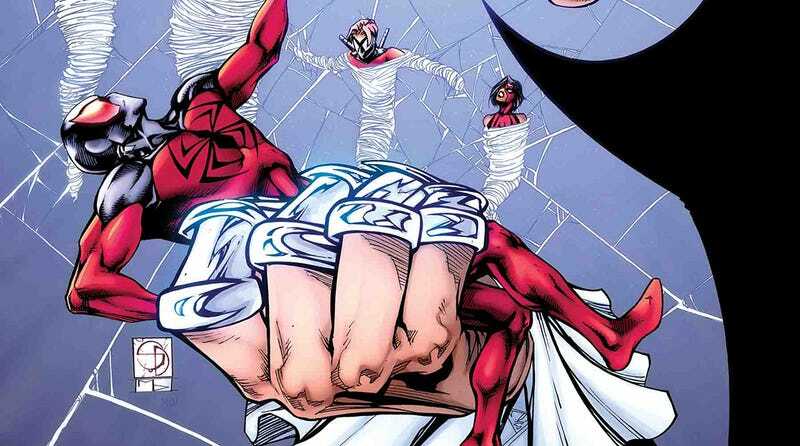 Spider-Force has Priest working with a team that includes Jessica “Spider-Woman” Drew, Kaine, Ashley Barton of the Old Man Logan future, and new characters Astro-Spider and Spider Kid, and he sends them on a suicide mission that ups the stakes at every turn. This exclusive preview of next week’s Spider-Force #2 has the team meeting their last member, and in typical superhero fashion, it starts with a fight. Pencillers Paulo Siqueira and Marcelo Ferreira, inkers Oren Junior and Roberto Poggi, and colorist Guru-eFX do phenomenal work capturing the energy of the script in their artwork, jumping between atmospheric horror to traditional superhero fisticuffs without losing any specificity. The splash page revealing a vampire on a space station has a classic horror composition, foregrounding a terrified face as Verna leaps out of the shadows. Astro-Spider also has a splash page where he’s leaping toward the reader, but the tone is very different, eliminating the harsh shadows and changing the positioning of his body so it reads less like a monster and more like a soldier charging into battle. This team works very well with Priest, and if he ever gets the urge to tell a longer Spider-Man story, he should get back together with the Spider-Force crew.